Above and beyond isn’t enough to describe these grantees. Each month, we’ll be featuring a new interview with an organization from our NEA Big Read community. 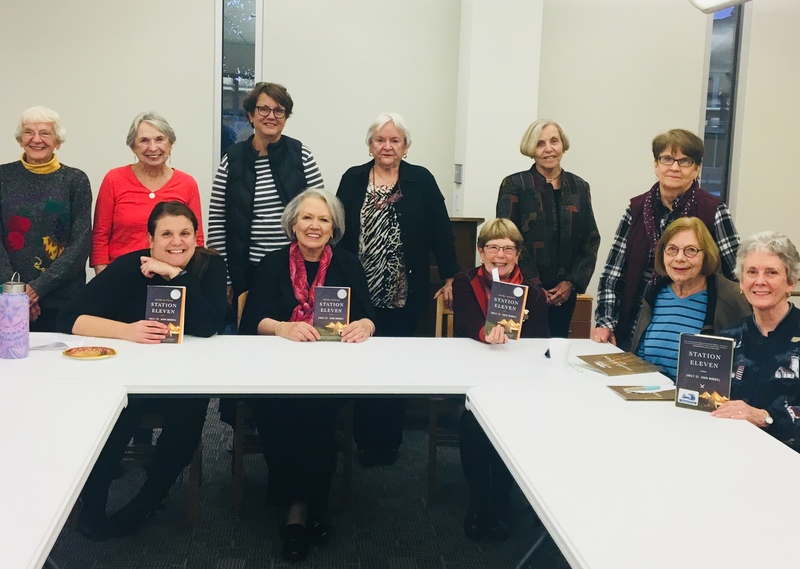 This month, Dr. Deborah Van Duinen from Hope College talks multigenerational programming, access to literature, and an NEA Big Read that helped their community find solidarity in difference. Hope College is a small private liberal arts college located in downtown Holland, Michigan, a city on the eastern edge of Lake Michigan in the southwest corner of the state. The mission of Hope College is to educate students for lives of leadership and service in a global society through academic and co-curricular programs of recognized excellence in the liberal arts and in the context of the historic Christian faith. Perhaps best known for its Dutch heritage and its annual Tulip Time Festival (recognized as USA Today’s 2016 Best Flower Festival), Holland, Michigan spans both Ottawa and Allegan county lines and has a population of 33,366. It has an urbanized area population of 113,164. Holland has an active community of small, locally-owned businesses, several large corporations such as Herman Miller, and Gentex, and partnerships with a 2-branch district library, 4 institutes of higher education, 5 public and 4 private school systems. While the NEA Big Read program is an excellent fit with Hope College’s mission and its previous experiences with federal, state, and local grants, it is the changing make-up of the Holland and surrounding Lakeshore communities that propels us in our work to initiate conversations about the arts, diversity, differences, and empathy. NEA Big Read Lakeshore committee group photo with Emily St. John Mandel. Photo by Sarah Simmons, courtesy of Hope College. Dr. Beth Trembley teaching a graphic novel writing workshop. Photo by Sarah Simmons, courtesy of Hope College. 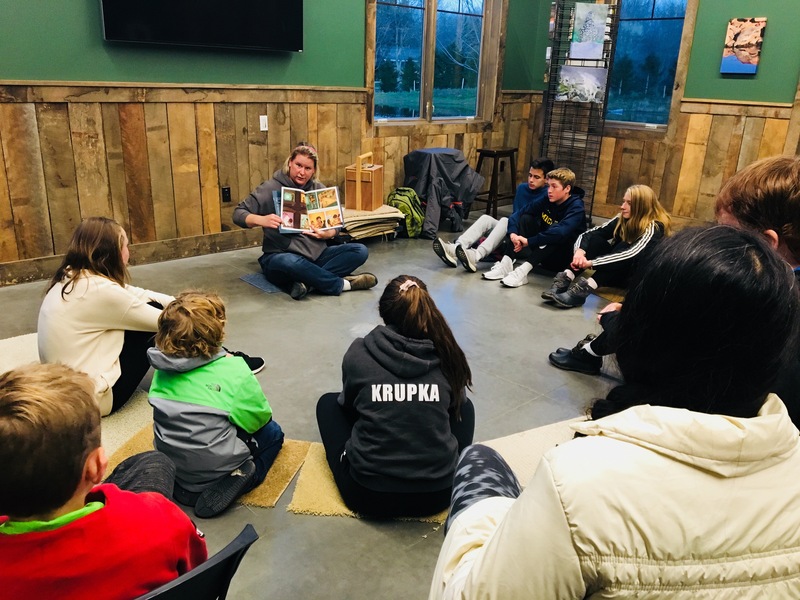 One of the unique features of our NEA Big Read Lakeshore is our P-16 school partnerships. This past year we had 16 schools, 25 teachers, and over 1,600 elementary, middle, high school students participate in our program. Teachers begin our Big Read professional development training six months prior to the start of our program and receive curricular support and resources for the teaching of our selected book. As part of this, we hire two artists-in-residence to work with these teachers and their students to collaboratively create art in response to literature. The culmination of our program every year is our Student Exhibition of Learning event in which the student artwork is showcased to our community. Typically there are over 1000 people who attend this exhibition. 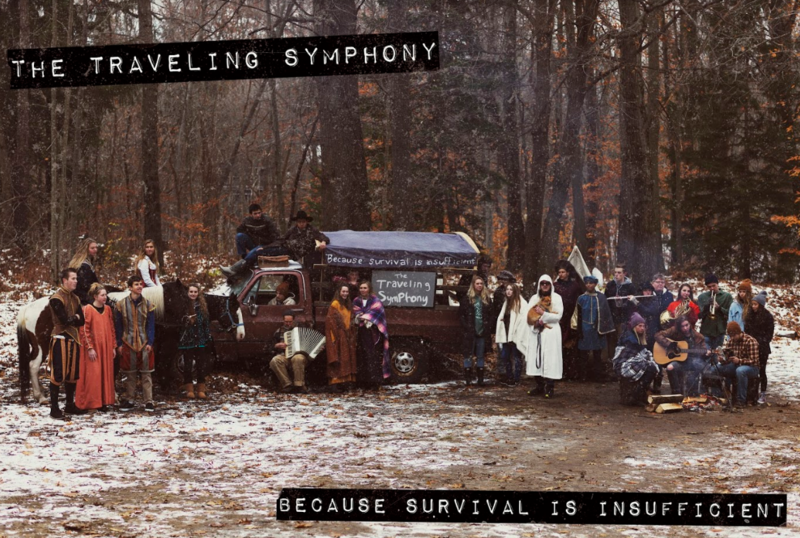 Saugatuck Public High School students’ Traveling Symphony photo shoot. Photo by Mitch Conrad, courtesy of Hope College. The Museum of Civilization at West Ottawa High School’s Student Exhibition of Learning. Photo by Sarah Simmons, courtesy of Hope College. Set 20 years after a devastating flu pandemic has destroyed civilization, Emily St. John Mandel’s Station Eleven tells the story of a small band of actors and musicians moving between the settlements of the altered world – until they encounter a violent prophet who threatens the tiny band’s existence. Mandel describes a world of hope, of people coping with nostalgia and loss, both in the present and the future: of the power of art and relationships to fulfill us, sustain us, and nurture us back to our best selves. 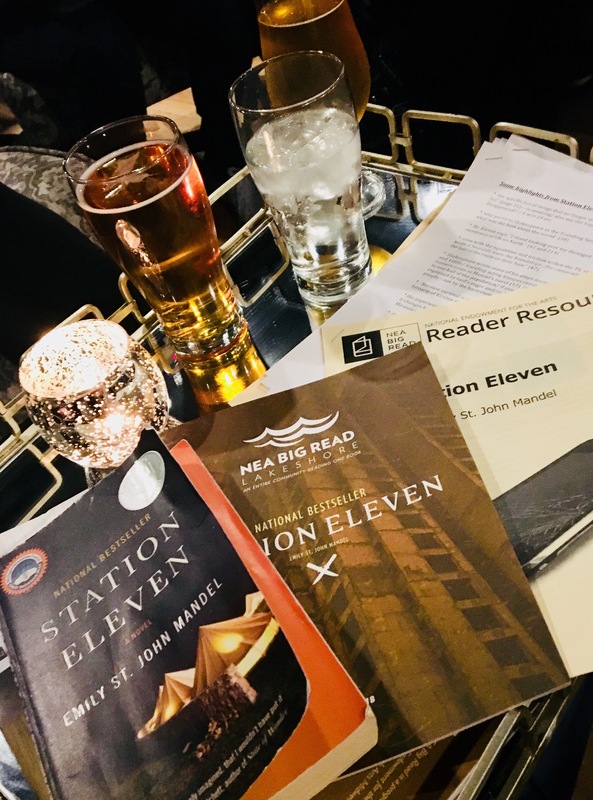 A quick answer to this question is that we selected Station Eleven because it takes place in Michigan and in our specific geographic region of Michigan. Members in our community loved trying to figure out where the events in the book took place and enjoyed the many references to the Great Lakes and Michigan landscape that we all know so well. One of our most enjoyed events was a Michigan survival-themed dinner with a menu consisting of local, seasonal foods. A longer answer is that, in addition to the setting, it encourages its readers to respond to the question: How do we want to live? For the past four years, our NEA Big Read selections encouraged participants to look back in history and reflect on societal problems that went wrong: race, impacts of war, immigration, and fear-induced discrimination. In our fifth year of programming, we chose a book that encouraged us to look ahead and envision what kind of society we want to create. Station Eleven paints a bleak landscape but its focus on the idea that “survival is insufficient” encouraged our community to find beauty in our brokenness, solidarity across our differences, and commonality in our aspirations to work for what is good and true. Book discussion led by Woman’s Literary Club. Photo by Deb Van Duinen, courtesy of Hope College. 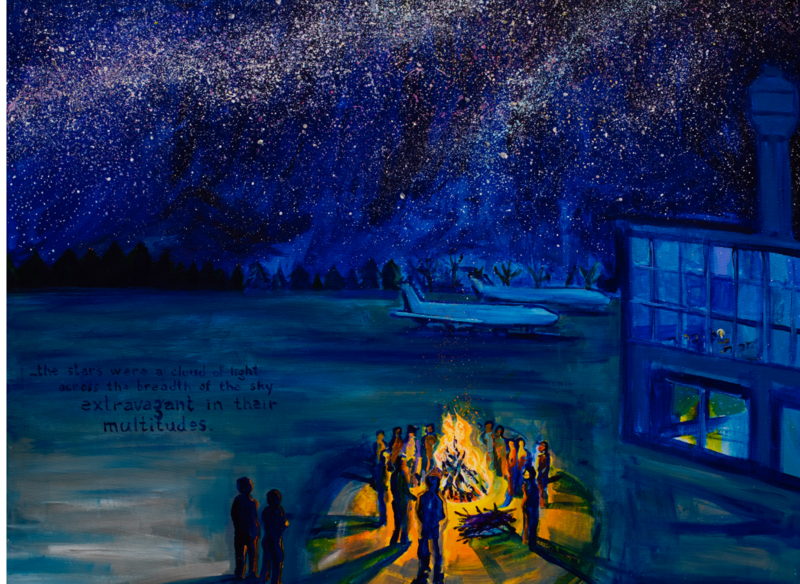 Painting of a Station Eleven scene by Holland Public High School students and artist Joel Schoon Tanis. Photo by Mitch Conrad, courtesy of Hope College. Our program has widespread community participation with diversity in age, socioeconomic status, educational experiences, and ethnicity/race. A significant contribution to this is the involvement of area schools and Hope College classes. The enthusiasm from area school teachers and professors for our program and their encouragement to their students to attend our events contributes to our high numbers of participants, particularly as many middle and high school students bring family members with them to events. An extension of this has been the development of our Little Read program. We started our Little Read in an effort to better include younger readers and families in our Big Read program. Every year we choose a children’s picture book and middle grade book that connects with the themes and topics in our Big Read book and work with our area libraries and elementary and middle schools to help promote our Little Read books alongside of our adult title. This year, we chose John Rocco’s 2012 Caldecott Honor Blackout, a story about a family in New York City who experiences a summer electrical power outage. We also chose Lois Lowry’s 1993 Newberry award winner, The Giver, a young adult dystopian novel. Our Big Read program included ten Little Read events including a Family Fort Night, Shadow Puppet workshop and a Nocturnal Nature walk. All of our Little Read events were well attended and well received. John Rocco at a school visit. Photo by Deb Van Duinen, courtesy of Hope College. 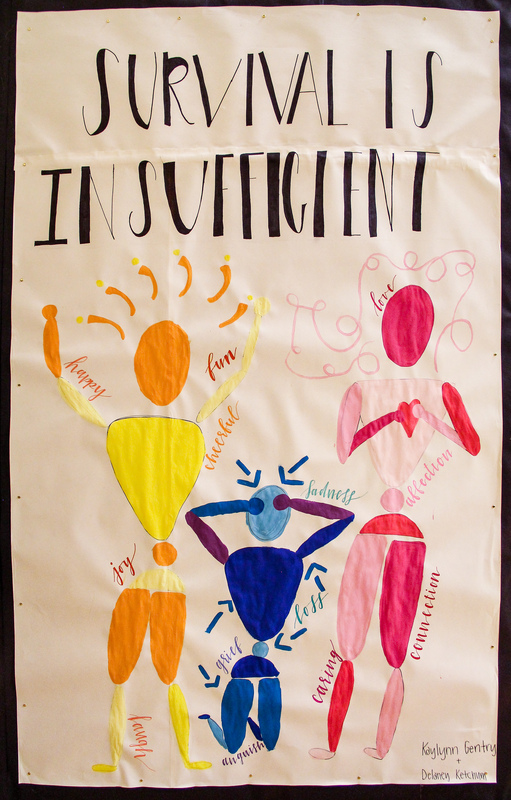 Cityside Middle School student artwork in response to The Giver. Photo by Sarah Simmons, courtesy of Hope College. A variety of events in diverse locations contributes to making a Big Read program successful. People’s literacy practices are intertwined with their identities; a one-size fits all program is not sufficient for meeting the varying and sometimes competing and conflicting interests, needs, and affiliations of individuals. Our NEA Big Read Lakeshore main events are intentionally planned to engage each book and its topics from a variety of perspectives, experiences, and angles, including not only lectures by engaging speakers, but also featuring film, food, music, and art to explore and celebrate the topics under discussion. In addition, we carefully consider where and when these events take place. Not everyone feels comfortable attending an event on a college campus or in a church. In the same way, lecture events might not appeal in the same way a film screening or an art workshop would. Our events take place in church basements and coffeeshops, art galleries and breweries, school auditoriums and outdoor nature centers. Outdoor Discovery Little Read Nocturnal Nature event. Photo by Deb Van Duinen, courtesy of Hope College. Getting ready for a book discussion at Brew Merchant. Photo by Deb Van Duinen, courtesy of Hope College. Every year we partner with area schools and provide free Big Read books and curricular resources to participating P-16 (preschool to college) students and teachers. As part of this, teachers and students read our Big Read book in their classrooms, attend our events and create art in response to the chosen piece of literature. This year, in response to their reading of the book, area students performed Shakespeare, played instruments, drew comics, created alternative Station Eleven book covers, assembled a Museum of Civilization, staged a Traveling Symphony photo shoot: to name just a few. 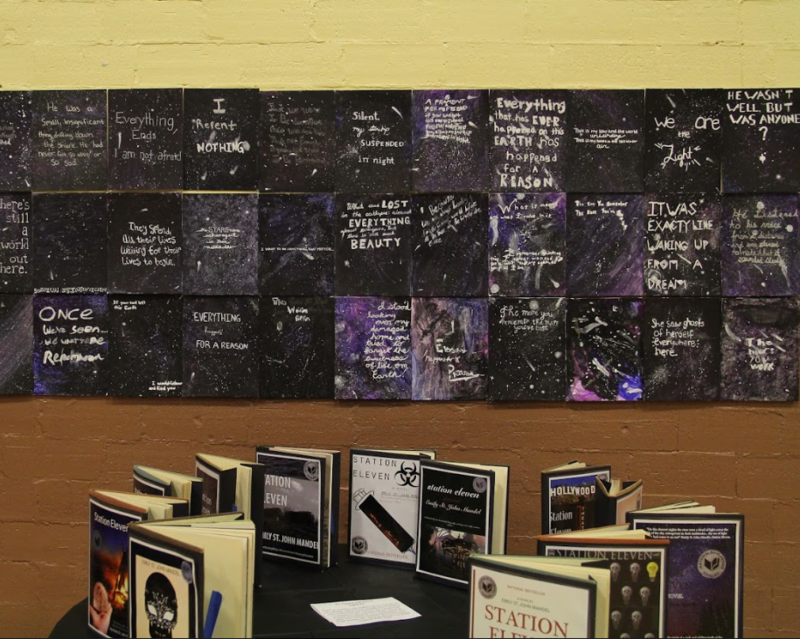 Alternative book covers by Holland High School students. Photo by Sarah Simmons, courtesy of Hope College. Last year our Big Read focused on Julie Otsuka’s When the Emperor Was Divine. Artist, writer, and speaker Makoto Fujimura participated in our program and in one of his lectures, shared with the audience a question that he has been repeatedly asked as an artist: “How do you find beauty when the world is so dark?”. He explained that while art can seem to be the least necessary in times of trauma can actually be the most useful. He argued that beauty often comes out of our brokenness as we refract light and that art – literature, music, theater, dance and visual art – has the power to transcend political, racial, and socioeconomic differences. One of the priorities for our Big Read program is making sure that students who read our Big Read book in their schools receive a free copy of it. For some children and teens in our community having a brand new book to take home, underline in it, and call it their own is a big deal. We also love hearing students’ feedback when they get to attend our author event for students. They love being able to hear from the author of the book they read and they love being able to submit questions to the author, some of which are chosen and read to the author during the event. One of our favorite moments from this past year was when the audience at our author Q&A (made up of 700 high school and college students) spontaneously burst into applause when Emily St. John Mandel walked on the stage. Student audience at Emily St. John Mandel’s Q&A. Photo by Sarah Simmons, courtesy of Hope College. It seems cliche to say but our favorite line from the book is “Survival is insufficient”. (To prove this point, one of our steering committee members has this line tattooed on the back of her neck! When she told Emily St. John Mandel about this during a book signing, Emily took a photo of the tattoo and posted it on Instagram). We love how this line reinforces the importance and necessity of engaging with the arts to make sense of our world. It also reinforces the goals and vision of Hope College’s NEA Big Read Lakeshore program. We work to create and foster a culture where reading matters. We strive to bring our community together around one book and use this shared experience of reading, discussing, and exploring the themes of the book as a springboard to learn from and listen to each other. A great book combines enrichment with enchantment. It awakens our imagination and enlarges our humanity. It can offer harrowing insights that somehow console and comfort us. 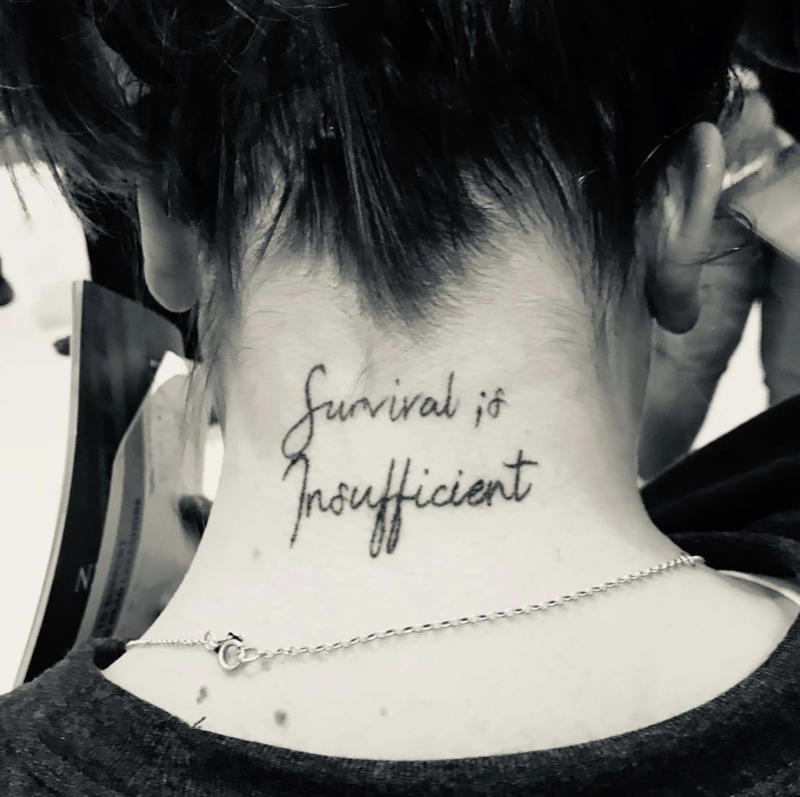 It reminds us that survival is insufficient.